By far one of the most exciting product ranges to be launched at the AusClean expo is the Cimex range of three brush multipurpose floor cleaning equipment, from world-leading manufacturer Truvox International. 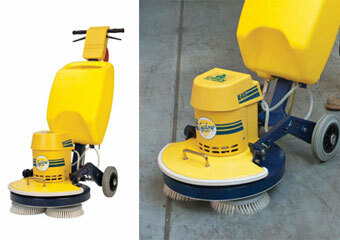 These revolutionary machines are available exclusively from commercial cleaning specialists Alphaclean. The versatile Cimex machines promise to offer unbeatable performance, ease of use and increased operator safety. With different models to suit clients’ varied floor types and cleaning requirements, every product centres upon a three brush counter-rotating system which prevents cables from snagging, extends brush life, saves money and provides the most effective solution for hard to clean surfaces. The Cimex ‘Cyclone’ scrubbers and polishers for instance, are ideal for deep cleaning vinyl, ceramic, concrete, wood, carpet, rubber and tiled floors. The floating brushes mean ordinarily tricky grout lines, slip-resistant floors and textured natural stones can also be cleaned with ease. Available in four sizes, this machine can be configured to suit clients’ specific needs, for instance a range of brushes are available for shampooing carpets, scrubbing hard floors and cleaning quarry tiles. This may be robust technology but the belt-driven machine is also incredibly quiet, making it ideal for hospitals, schools and aged care environments. For particularly tough environments, clients may opt for the Cimex heavy duty range. These incredibly durable machines have been purposefully designed for industrial cleaning, floor preparation and scarifying. This is the perfect equipment for cleaning professionals maintaining marble and terrazzo, removing oil and grease from concrete floors, scoring concrete for re-screeding and levelling, combatting rust and paint on steel chequered plates and getting rid of hardy glue, rubber and carpet backing foam. These commercial and industrial cleaning machines are complemented by Truvox’s Cimex Encap system. This polymeric carpet cleaning solution releases sticky soil from carpet fibres, before encapsulating the dirt as this low-moisture product dries. Once the carpet has dried, the dirt can simply be vacuumed away, leaving even the most heavily-soiled carpets thoroughly cleaned with minimum disruption.